“How do I edit my first draft? When I put out my survey recently, I asked you to let me known the one thing I can help you with this year. The questions above are just a smattering of the many I received asking how exactly to edit a manuscript, particularly a first draft. I’ve got some things to say on this subject, and I’ve had a lot of editing experience, but I’m not a professional editor of fiction. So I thought the best possible way to help all of the people who are stuck when it comes to the editing process is to invite some help along. 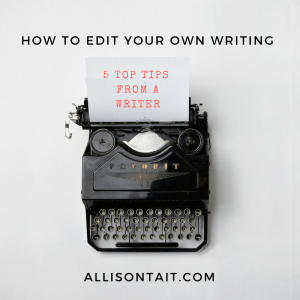 To whit, below you will find my top 5 tips for editing your own writing – from a writer’s perspective. Don’t panic. I remember the first time I had to edit a first draft from start to finish. I felt as though I was wading through words, rolling in words, drowning in words. Seriously, you can read about it here. The secret is not to panic. Yes, every time you make a change at the start, it has ripples throughout the story, but that’s editing. That’s rewriting. Nobody said it would be easy. Take it one word at a time. Some of the best advice I ever got about editing came from my writer friend Allison Rushby. When faced with editing your first draft, go through it and make the small changes first. Do the do-able stuff. Fill in missed words, look for inconsistencies, fix the typos. This will make you feel as though you’re making progress. BUT (oh yeah, there’s a big but), as you’re doing that, make notes about the obvious, glaring plot holes, the bits where you need less detail (or more detail), the paragraphs that have you scratching your head and, perhaps most importantly, all the questions that arise as you’re reading. I usually end up with at least a page of these, usually ending with ‘What was I thinking?’. Now that you know the ending… The real Big Picture work begins with the ending. Now that you have a first draft, you have a clear picture of where your novel is heading – and it’s time to look at where you began. Did you start your story in the right place? Invariably, for me, the answer is no. When you’re writing adventure-driven middle-grade fiction, you need to start in the action. I have a tendency to meander in, with the backstory strapped to my character’s back, and it often takes me a full chapter to get that out of my system. I swear that two out of the four books in The Mapmaker Chronicles series to date have had their beginnings lopped by 2000 or more words. Take a long hard look at your beginning. Map your structure. When I do school talks, the kids and I often have a little chat about the story mountain. If you haven’t seen one of these, it looks like this. If you are a plotter, chances are you’ve already done this. Usually these points are clear once the first draft is written, but if they’re not, there’s a lot of work to do. Don’t touch the keyboard until you’ve thought about it. I cannot emphasise this point enough. Even if you think you know exactly what you need to do to make this manuscript a world-beating best-selling prize-winning novel, don’t do it. Let it mellow. Think it through. Allow your sub-conscious to draw surprising threads together, to make connections, to really unearth your character. Publishing is a waiting game and it starts right here.